Rodney created one Padlet for each domain in the Charlotte Danielson framework. (You can download the full evaluation instrument here). Then he created a master Padlet onto which he embedded each of the Padlets allowing one spot to collect all the artifacts and evidence of his effectiveness as a teacher. From the main page, you can click on any of the Domains to bring you to another Padlet that allows you to get a look at the original files, photos, videos, or other work that makes up the artifacts or evidence collected. Here are some other nice features when using Padlet to showcase effectiveness. You can allow peers and administrators to contribute to the board sharing feedback and ideas. This interactive dialog also serves as evidence of professional growth. 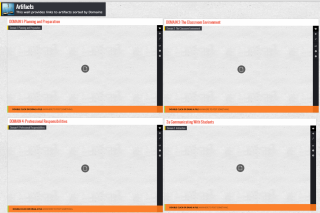 You can have students upload work directly to a board which can itself serve as an artifact. For example, you could have students create "About Me and My Heritage" videos, upload them to a Padlet, and that Padlet can serve as an artifact aligned to component 1b: Demonstrating knowledge of students. There can be a post on the Padlet aligning it to the indicator: "Teacher designed opportunities for families to share their heritage." Invite some experts in the field to look at your board a post a comment about it. This is a great way to show that you are making global connections to inform your work. This aligns to domain 4: Professional responsibility. Thank you to Rodney Schneider for sharing this innovative resource he is using to showcase his work. What do you think? Is this a tool you might use to showcase your work? Why or why not?